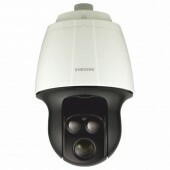 2MP 1080p Full HD 20x Network IR Dome Camera. Max. 2MP (1920x1080) resolution. 16 : 9 Full HD (1080p) resolution support. Built-in 20x optical zoom lens (4.45 ~ 89mm). WDR, UPnP and face detection support. IP66/IK10, IR LED (IR distance 100m, LED 2ea).